May 8, 2011 By This post may contain affiliate links. 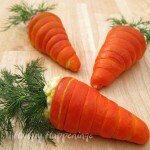 Looking for a beautiful appetizer to make? Try making this Beautiful Bouquet of Fried Won Ton Roses! Normal roses are beautiful but these are mouth-wateringly delicious! The party was being held at my friend’s house and we had spent the previous two days getting ready. The day of the event, our preparations were going great, all the cold food was on serving platters and much of the hot food was in chafing dishes. There was one dish, puff pastry pinwheels filled with beef tenderloin and a Madeira mushroom cream sauce, that would be baked after the guests arrived. It was the dish we were the most proud of and were so excited to serve it at the party. The day had been cloudy and windy but nothing out of the ordinary, but just as the guests started arriving the winds kicked into high gear. I’d never seen such strong winds. As tree limbs started flying through the yard we got nervous. Well, I was mostly nervous that my brand new Prius sitting in the driveway was going to be squashed by falling timber. It hadn’t dawned on me, until it happened, that the power would go out. Fortunately is was daylight and my friend’s house has lots of windows, so our guests were not left in the dark, but we no longer had the use of the oven. We had spent hours preparing the puff pastries and couldn’t imagine not serving them to our guests. So my co-host’s daughter got on the phone to see if any of her friends, who lived nearby, still had power. After a few calls, she found a friend with power, who graciously invited us to use her oven. So, as my co-host got the party started, I packed up and drove to some stranger’s house to use an oven. The oven was pre-heated to 450 degrees when we arrived, so I popped in the pastries. I noticed the oven floor was covered in goo. One of the resident teens had cooked a chicken pot pie that afternoon and allowed it to boil over. About ten minutes into the baking cycle, we smelled smoke. I ran to the oven to find that a fire had broken out. I quickly turned off the oven, but was too afraid to reach into a fire to remove the pastries. Then to my relief and my total embarrassment, the teen’s father arrived home, grabbed the pastries out of the oven, and put out the fire. After apologizing profusely, I cleaned the oven then resumed baking the pastries. I arrived back at the party with beautifully baked pastries and no one was the wiser. The power was not restored during the shower, but that didn’t put a damper on the party. Everyone had a nice time and they thoroughly enjoyed the food, especially the puff pastry pinwheels. It is surely a party I will never forget. 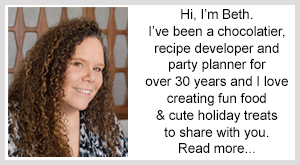 A friend’s daughter is getting married soon and I’ve been thinking about recipes for the bridal shower. 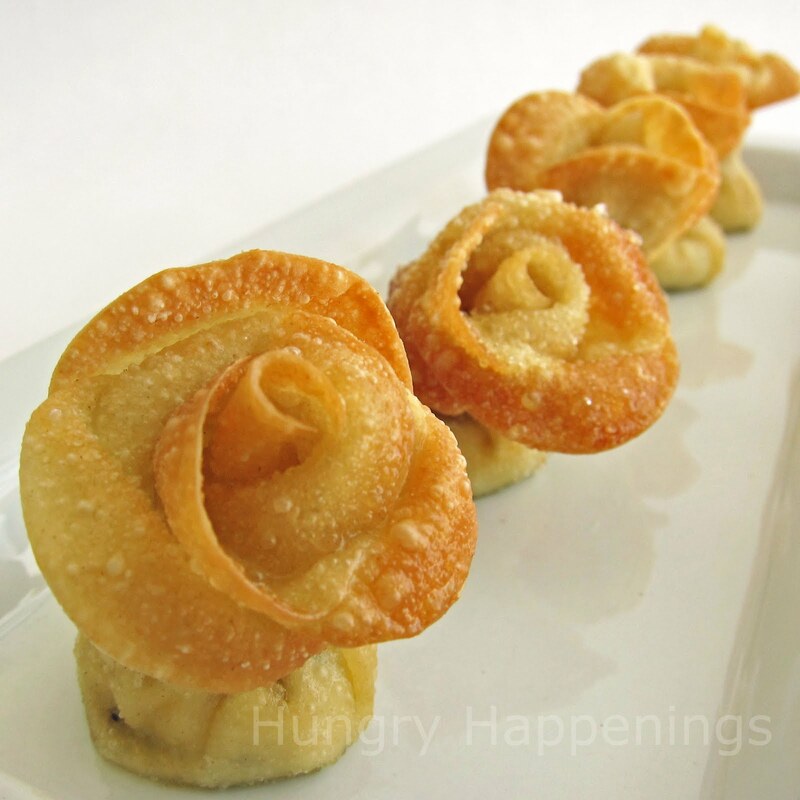 I came up with the idea for these Fried Won Ton Roses while making roses out of modeling chocolate. As I worked, my mind wandered. I thought about other foods that could possibly be used to make the roses and decided to try using some pasta sheets. I had some won ton wrappers in the fridge, so I cut a large round, filled it with some artichoke cream cheese, attached some petals using egg wash, and fried it. I was amazed at how beautiful it looked when it came out of the fryer. The petals held their shape perfectly and I loved the variation of cream and golden brown colors on the rose. 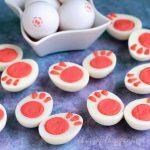 I knew that these appetizers would require a bit of effort, but felt that they would make an amazing addition to any bridal shower buffet or even a Mother’s Day, Valentine’s Day, or birthday party spread. 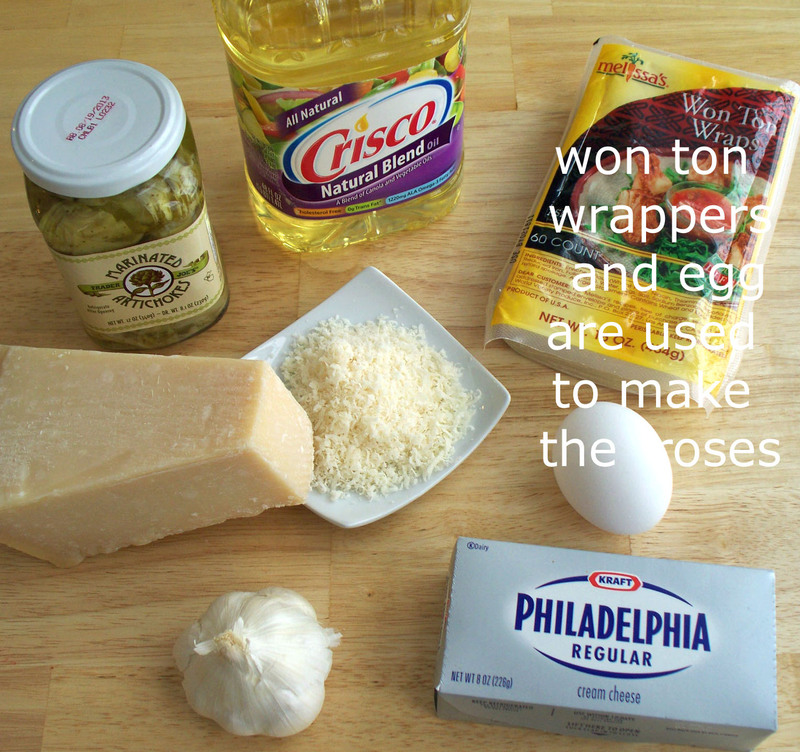 I filled my roses with an artichoke cream cheese and I’ve shared this recipe, but it will make much more than you need to fill the flowers. If you prefer, you can just buy flavored cream cheese, make a crab Rangoon filling, or even use mini mozzarella balls to fill your flowers. Just a teaspoon of filling is used for each flower. Each rose requires about 2 1/2 won ton wrappers. Some packages of the wrappers have as few as 24 while others have 60. I used a package of 48 and created 20 roses. Plan according to your needs or the number of wrappers in the package you purchase. 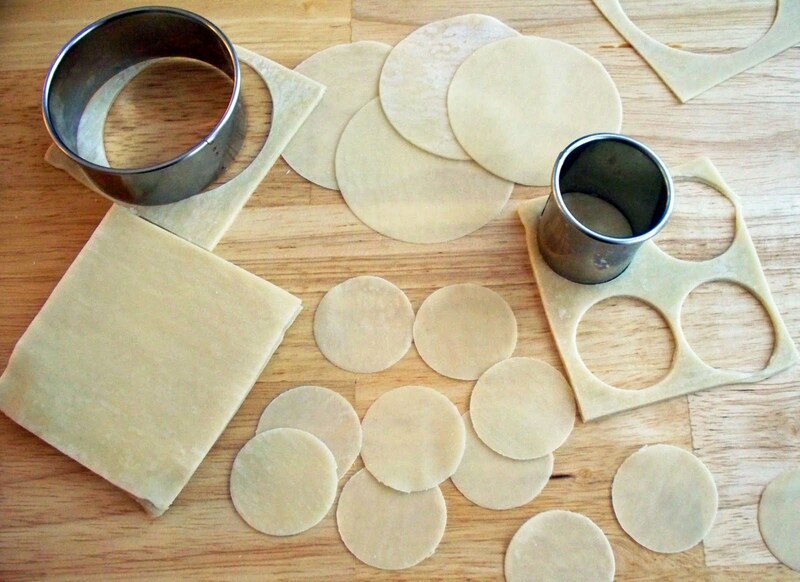 Using the round cookie cutters, cut 20 of the 3 1/2″ rounds and 112 of the 1 1/2″ rounds out of the won ton wrappers. 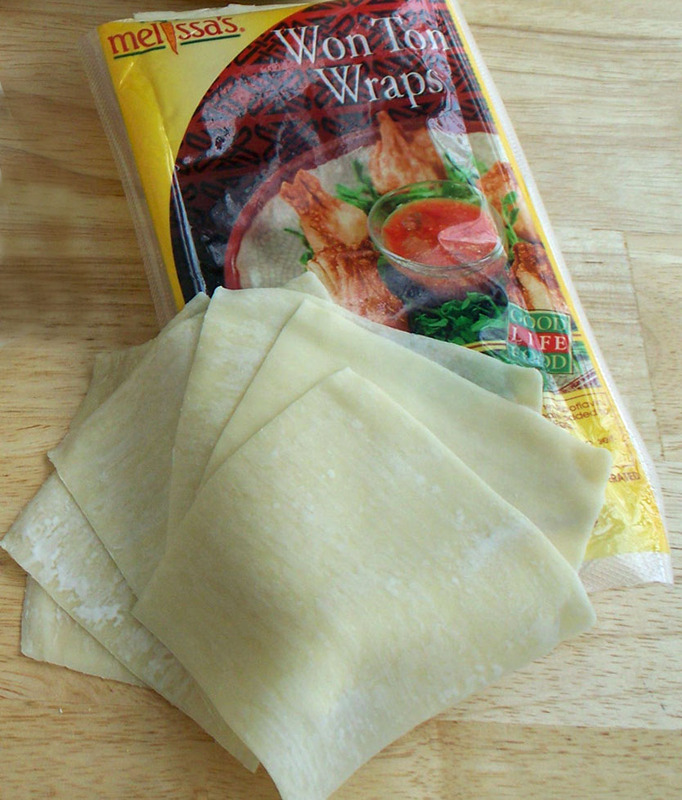 While you work, you may want to cover the won ton wrappers with a damp towel, so that the wrappers don’t dry out. Brush egg wash over one half of a 1 1/2″ won ton round (from now on I’ll call these petals.) Wrap the the petal around the pointed part of the base attaching the egg washed half of the petal directly to the base and leaving the upper half extended above the base forming a tube. Brush egg wash over the bottom of another petal and wrap it around the center petal flaring out the outer edge of the petal and pinching the bottom edge (the half brushed with egg wash) around the base. Continue to add petals. As you add each petal you want to overlap the last petal you added. Continue to add petals until you have added 5 or 6. You will have enough petals to have some roses with 5 petals and some with 6 petals. You could make some bigger with 7 or 8 like the flower on the far right and some that are smaller buds. It’s up to you how full you’d like them. Preheat oil in a fryer or in a stock pot to 375 degrees. 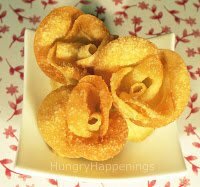 Place a few won ton roses in the hot oil and fry until crisp and golden brown. Continue to fry a few roses at a time, allowing the oil to come back to 375 degrees before each batch is fried. 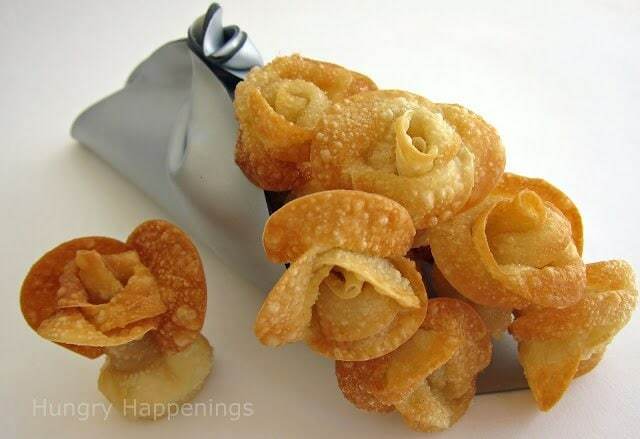 Once fried, place roses on a few layers of paper towels to allow the excess oil to drain. These roses are best if served soon after frying, but are also pretty good cold. If you need to make these ahead of time, you can assemble the roses and keep them covered and refrigerated for up to 8 hours. Then fry them just before or during your party. I actually made a batch, put some of them in the refrigerator and ate them the next day. They were surprisingly still crispy and not bad at all, but I definitely preferred them the day they were fried. Place garlic cloves on a piece of aluminum foil. Drizzle with olive oil. Fold up foil to seal well. Roast for 30 minutes or until the garlic is nicely browned and very soft. Cut off one tip of the garlic and squeeze the garlic out of the peels. Drain artichokes well. Place artichokes, garlic, cream cheese, and Parmigiano Reggiano cheese in the bowl of a food processor. Pulse until smooth. Add salt and pepper to taste. If you don’t have a food processor, finely chop the artichokes and use a hand held mixer or spoon to mix the ingredients. 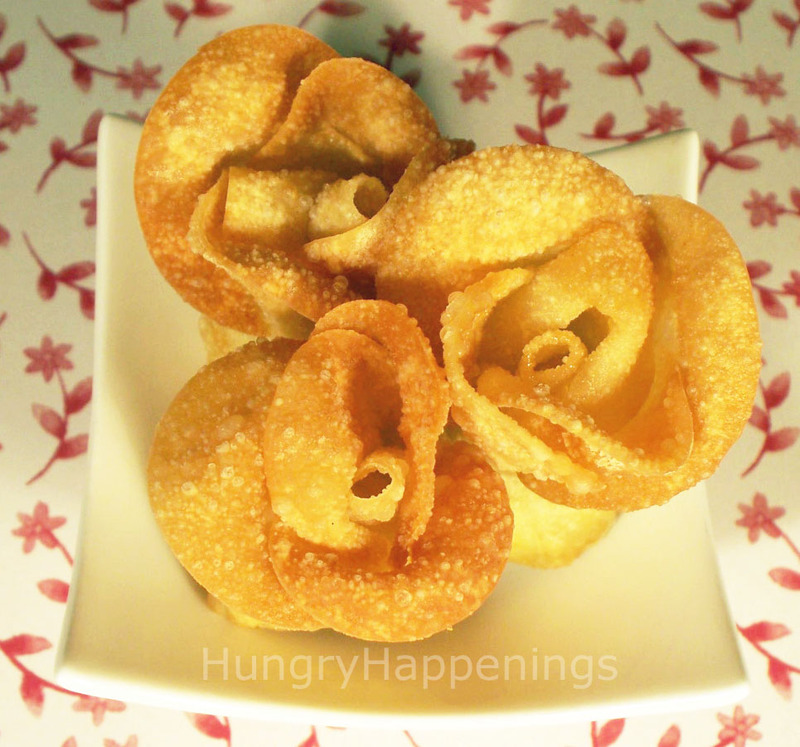 Use 20 teaspoons (a little less than 1/2 cup) for the Fried Won Ton Roses recipe. Serve the remaining cheese with tortilla chips, pita chips, or crackers. 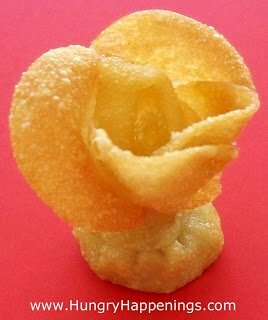 Roses are created using won ton wrapper petals and are filled with flavored cream cheese and fried to a beautiful golden brown. 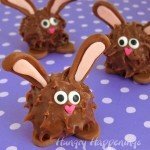 I never would have thought to use an artichoke filling for these, let alone make them into roses! Those are gorgeous…and definitely prettier than what I typically have had at showers. 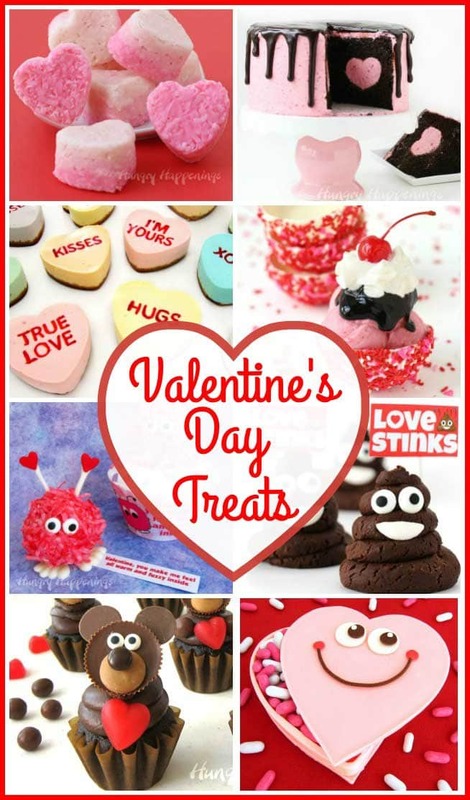 I’m so glad that the oven fire didn’t ruin your beautiful creations…thanks for sharing! How beautiful! 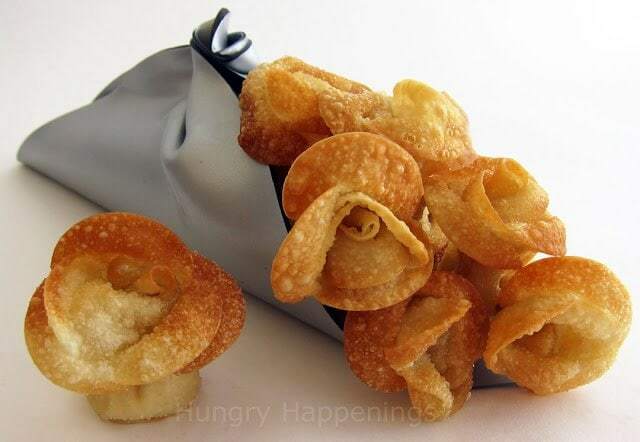 I never even knew you could do such a thing with wontons! I think if I was there, I would completely agree with the father of the bride- everything sounds incredible. I'd love to have you throw my bridal shower one day!! 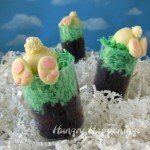 These are gorgeous, and I bet so delicious! Artichoke filling sounds amazing too! Never would have thought of that! Thanks everyone for your nice comments. This was an experiment that went brilliantly well. I was so happy with the end results and I'm glad you like them. I'm a new follower just stopping by to say hi! I came across your blog from a photo on tastespotting… this wonton rose is seriously cool! Oh my gosh, these look incredible!! 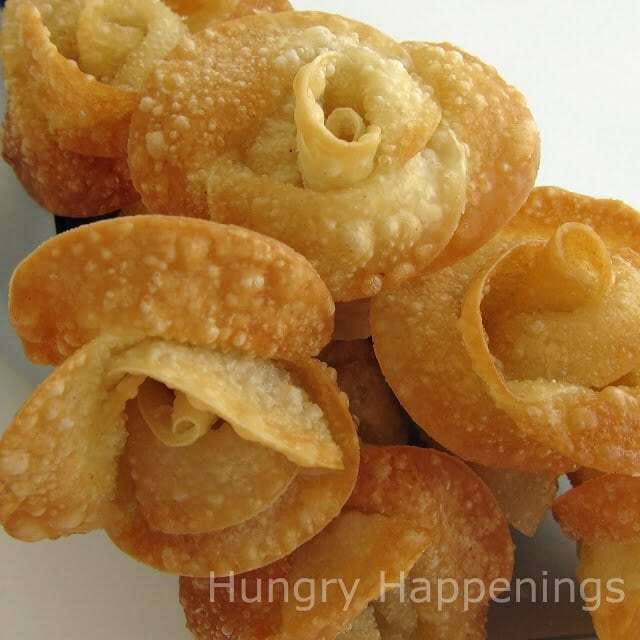 Crab Rangoon is one of my favorite things to order at Chinese restaurants, and with an artichoke cream cheese filling I think these might even top that! Thanks for sharing! These are awesome! Do you know if they can be made ahead of time and frozen. 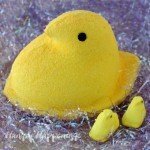 They looks so time consuming to make, I would like to make them for Thanksgiving but fill them with something sweet like an apple pie filling and dust with powdered sugar. Jo, to be totally honest I have not tried to freeze these, but assume it could be done. 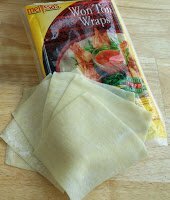 Egg rolls keep well in the freezer and the fried won ton wrappers in this recipe are basically the same thing as an egg roll wrapper. I would think you would could thaw them and then just heat them back up in the oven to warm them before serving. These are awesome thanks so much for sharing !!!! I tried making fried wontons a few days back, the outside was nice and crispy but the inside was bit chewy where there were more than 2 folds of the wrapper. 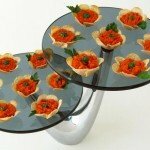 Did u have a similar problem since u have added 5-6 petals on top of each other? any tips would be helpful. The most important thing to remember when frying these is to keep the temperature of the oil consistent. I heat my oil to 375 degrees then I fry a few won tons, remove them from the oil, and allow it to come back up to 375 degrees before frying more. If the oil gets too cool you wont end up with crispy won tons and they will soak up a lot of oil and be greasy and wont cook all the way through.